Steve Komphela jokingly said Itumeleng Khune also has to earn his salary when asked if the goalkeeper’s constant Man-of-the-Man performances speak of Kaizer Chiefs’ nervous defending. But the 50-year-old admitted his defence needed improvement despite a clean sheet in their 3-0 beating of Golden Arrows in a Nedbank Cup last-32 match on Sunday afternoon. 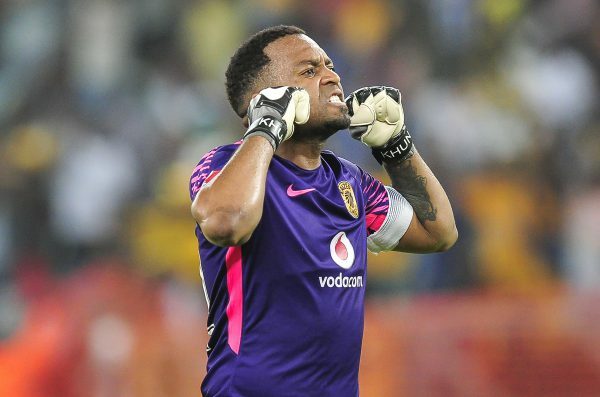 “Let me whisper this answer so that he (Khune) doesn’t hear … he must earn his salary,” said Komphela. “He is top quality. He pulls off unbelievable saves. If you have a top keeper you have confidence when you are defending. “You can never do everything perfect in football and when we make mistakes the one at the back must come through and it’s good to see he does. We have to polish up our defending though,” he said. Arrows gave Chiefs a run for their money and were unlucky not to have scored with Khune pulling off some almost miraculous saves. “It was a very difficult match. They felt comfortable in the first half and we only unsettled them a little in the second half. We got better in the second half and we could have scored one or two more goals. It was not as easy as the scoreboard suggests though,” added Komphela. With their name now in the hat for Thursday night’s draw, Amakhosi will shift focus back to the Absa Premiership where they lie fourth and seven points behind leaders Mamelodi Sundowns. “This win will be a confidence- booster. It is going to be very tight and competitive. Inasmuch as we look at ourselves and Mamelodi Sundowns, we also have to factor in our neighbours (Orlando Pirates) who are also in the mix. It is going to be very interesting. Chiefs’ next game is at home to another side in the title mix, Cape Town City, at the FNB Stadium on Saturday.